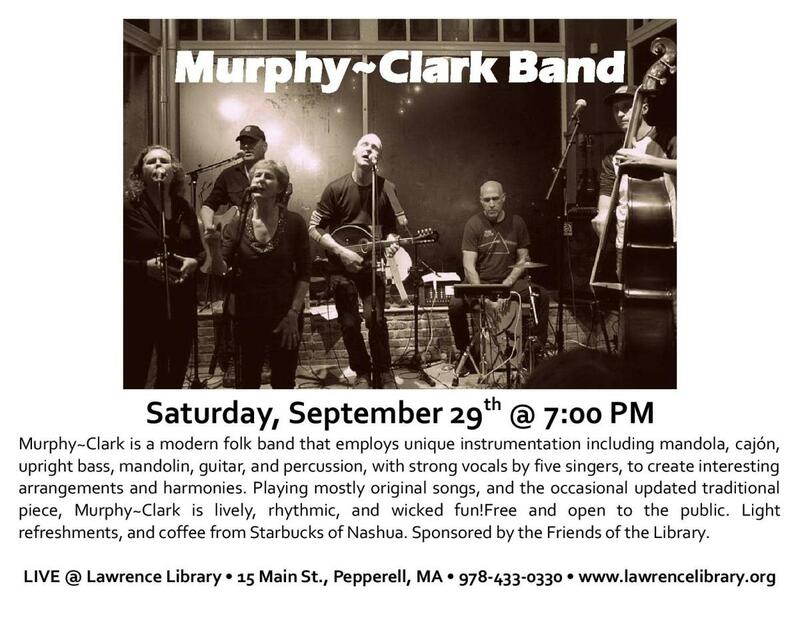 Murphy~Clark is a six-piece original Modern Folk band based out of Southern New Hampshire. With expert playing and singing throughout, Murphy~Clark employs unique instrumentation including mandola, cajon, upright bass, mandolin, guitar and percussion, along with strong vocals by five singers, to weave creative and interesting arrangements and harmonies. Featuring mostly original songs and the occasional updated traditional piece, Murphy~Clark is lively, rhythmic and wicked fun! Live @ Lawrence Library is held in the smoke-free intimate environment of the Art Gallery. Fantastic acoustics draw musicians and listeners from throughout New England. Light refreshments and Starbucks coffee are provided by Friends of the Library. All library events are funded by the Friends of the Lawrence Library and are Free and open to the public.